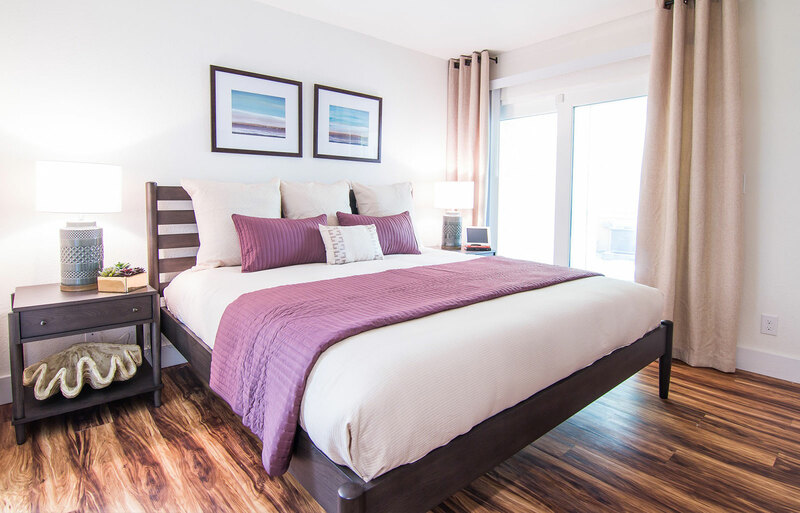 Innovo Living on Waters has the perfect balance of exquisite design, luxury, and variety within our newly appointed apartment homes to compliment your lifestyle. Our open floor plan designs will welcome you home to wood plank flooring, gourmet kitchens with stainless steel appliances, sound reduction impact resistant glass windows and sliding doors to escape everyday stresses; as well as, large screened in patios* – all to enhance your Living Experience…. This 530-square-foot studio features a covered entry, a large sleeping area with walk-in closet and additional closet, a screened-in patio, a laundry closet equipped with full size washer & dryer, and an L-shaped kitchen with pantry closet. This studio apartment home rents from $970-$975. At 730 square feet, This spacious one-bedroom, one-bath apartment home with an open living room, in-line kitchen, and a laundry room. The bedroom features two walk-in closets. The screened-in patio is located off the living room. 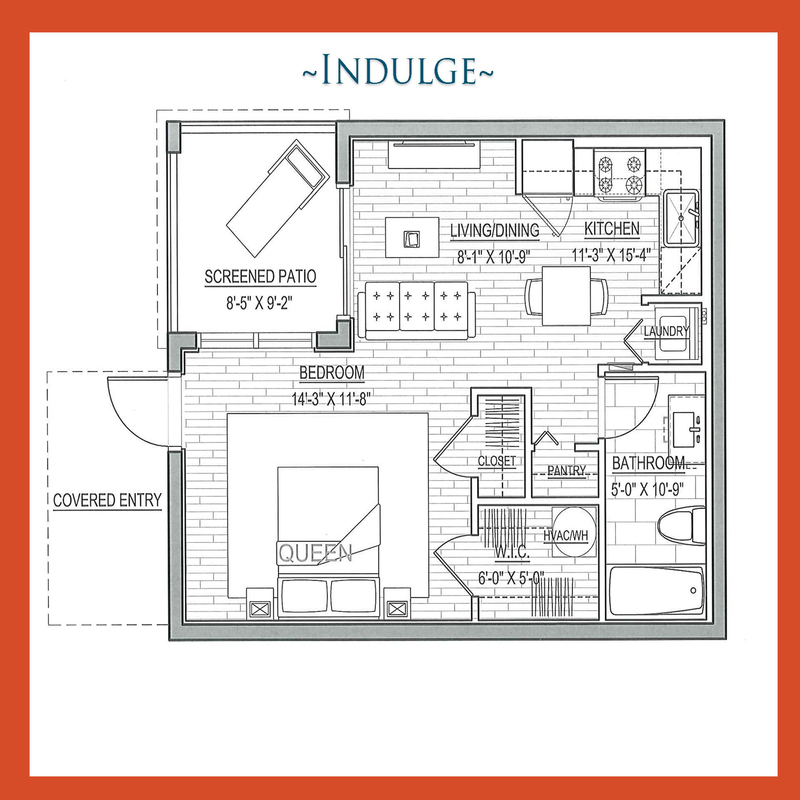 This floor plan starts at $1,170. This is a large one-bedroom, one-bath apartment home with 795 square feet of living space. The bedroom has a walk-in closet and is large enough to fit a king-size bed. The covered entry leads into the living area and includes a coat closet. This apartment home has an in-line kitchen which includes a fully functional island and a large laundry closet equipped with a full size washer & dryer. The screened-in patio is located off the living room. This apartment home begins at $1,220. This one-bedroom, 1.5-bath townhome has 835 square feet of living space. The lower level has a covered entry way and a screened-in patio. There’s also an L-shaped kitchen, living and dining area, a laundry room, and a half guest bathroom. The upper level contains the large bedroom with space for a king-size bed, a huge walk-in closet, and a full bathroom. This townhome rents from $1225 -$1290. This two-bedroom, two-bath apartment home has 935 square feet of living space. 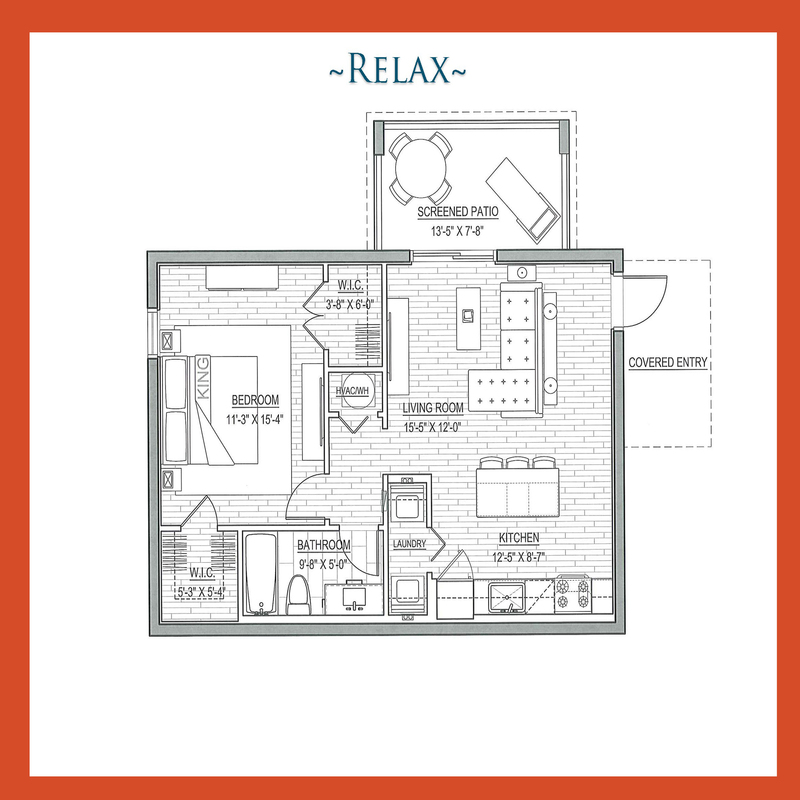 This floor plan features a large master suite with two closets and a private bathroom, a corner screened-in patio with access from the master and the kitchen, an oversized guest room with room for a king-size bed, and an open living area. The galley-style kitchen includes a built in dinning island. This apartment home rents from $1,320. 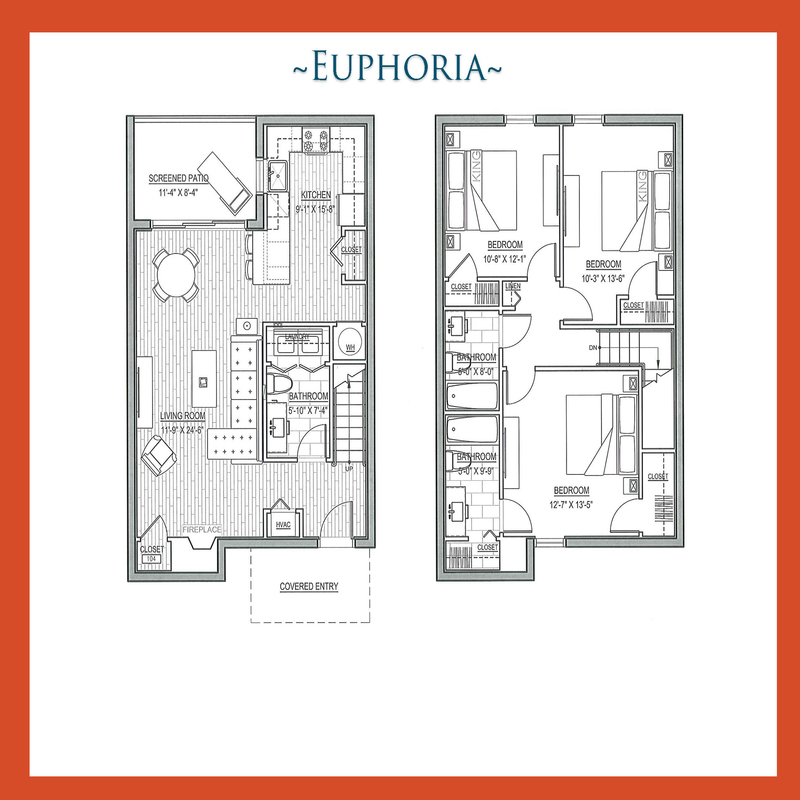 This two-bedroom, two-bath floor plan has 1,115 square feet of living space. This apartment home has a covered entryway that leads into the open living area. The galley-style kitchen includes a built in dining island and laundry room equipped with a full size washer & dryer. The screened-in patio is located off the living room. The master bedroom has a walk-in closet and en suite bath. The second bedroom has private access to the Jack-and-Jill style guest bathroom. 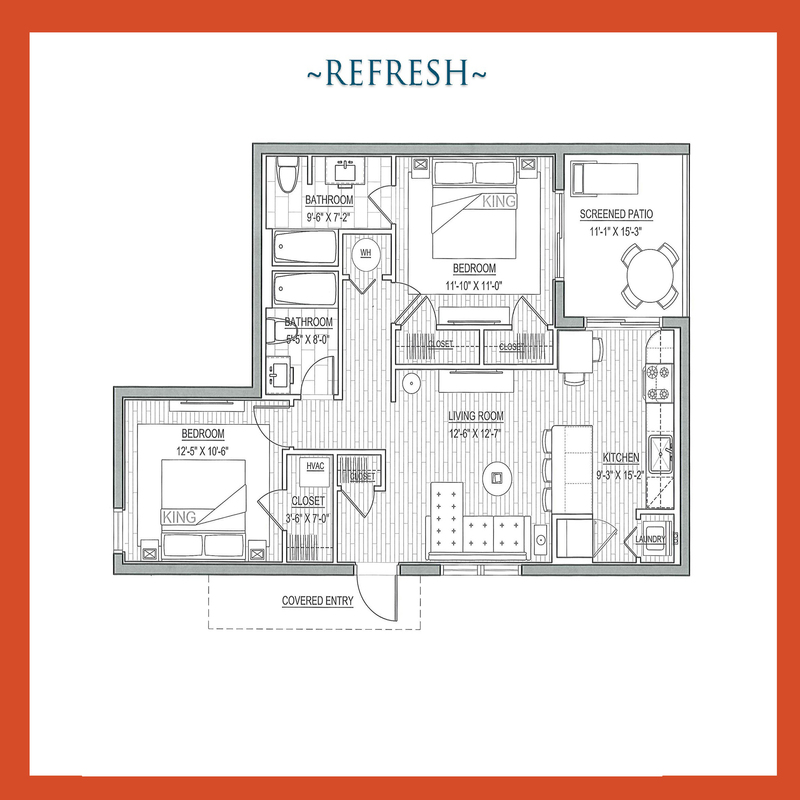 This floor plan also features a spacious utility room and a coat closet. This apartment home’s rent starts at $1390. 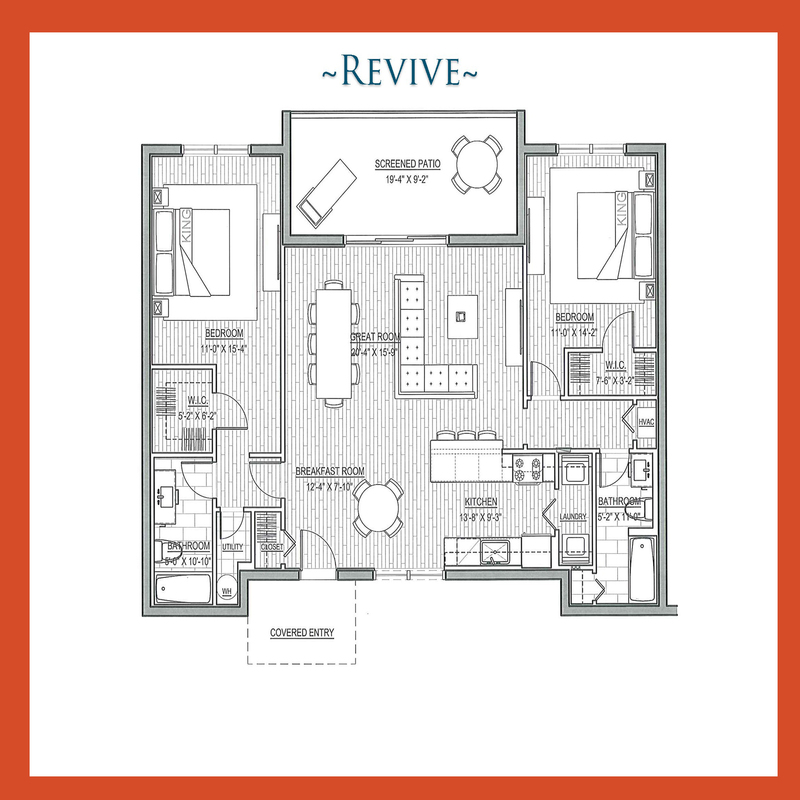 Revive is a two-bedroom, two-bath split floor plan with 1,315 square feet of living space. This apartment home features a huge great room with access to the screened-in patio, a galley-style kitchen with dining island. The master bedroom has a walk-in closet, en suite bath, and a utility closet. 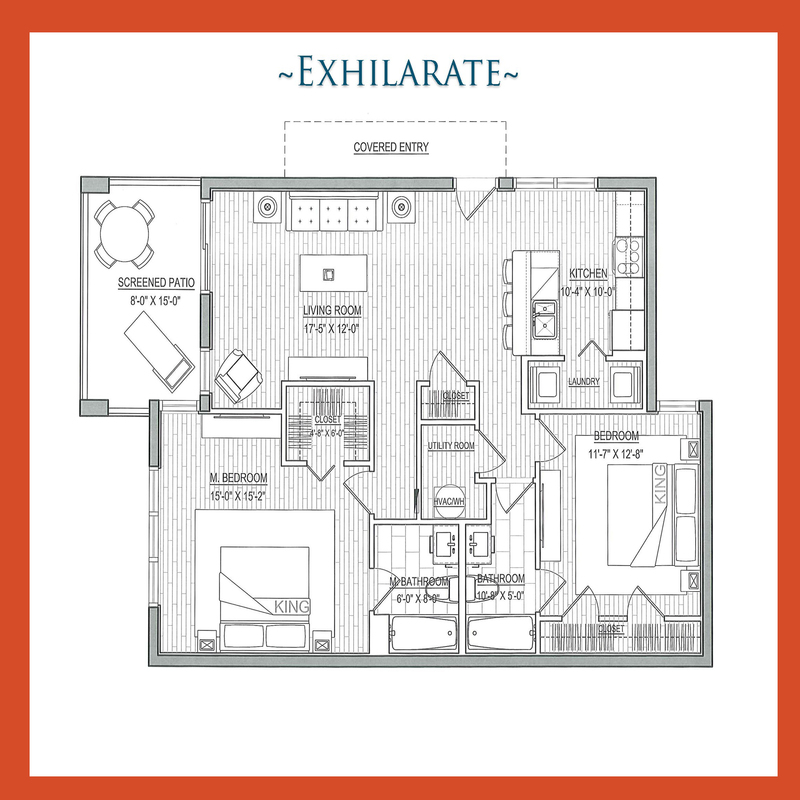 The large second bedroom is on the opposite side of the living area and includes a large closet. This apartment home rents from $1470. 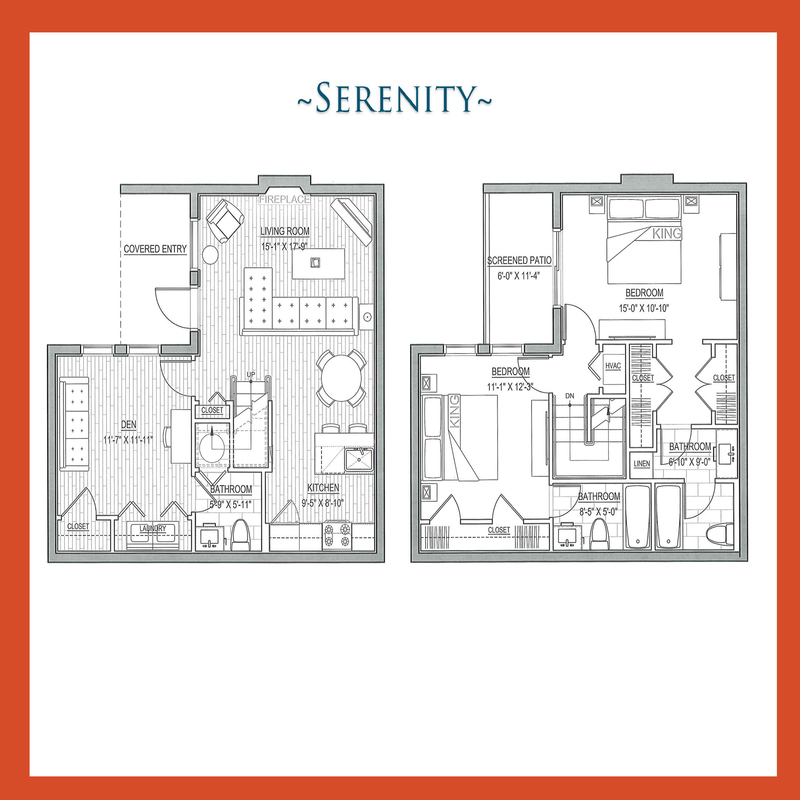 The Serenity is a 1325 sq. ft. two bedroom 2.5 bath townhome with a a den and bonus room.The main level features a covered entryway, a large living room with fireplace*, and the galley-style kitchen with dining island. 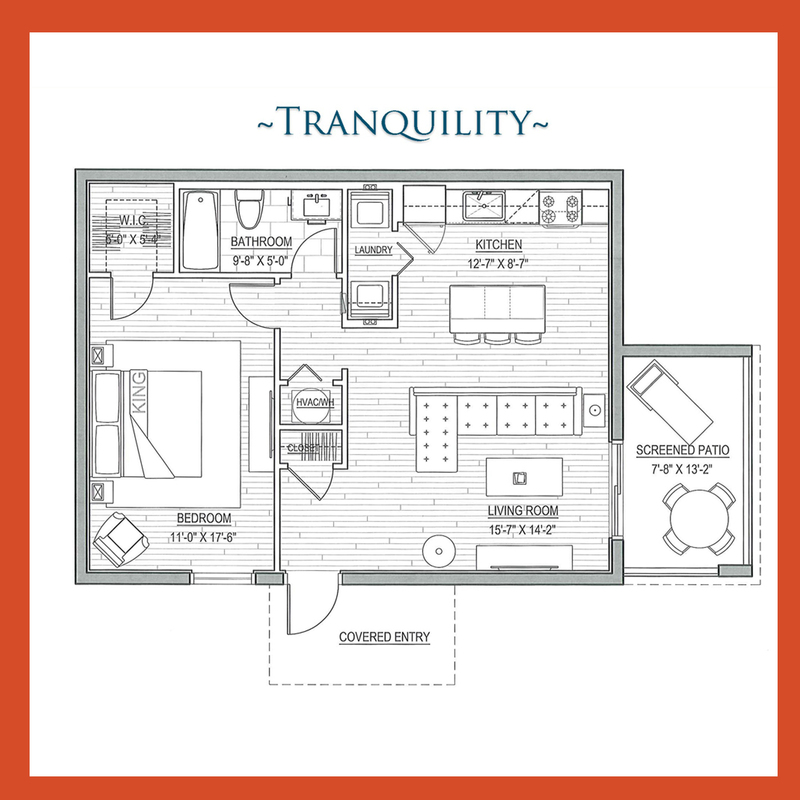 The lower level also features a den with closet, laundry closet equipped with a full size washer & dryer, and half bath. 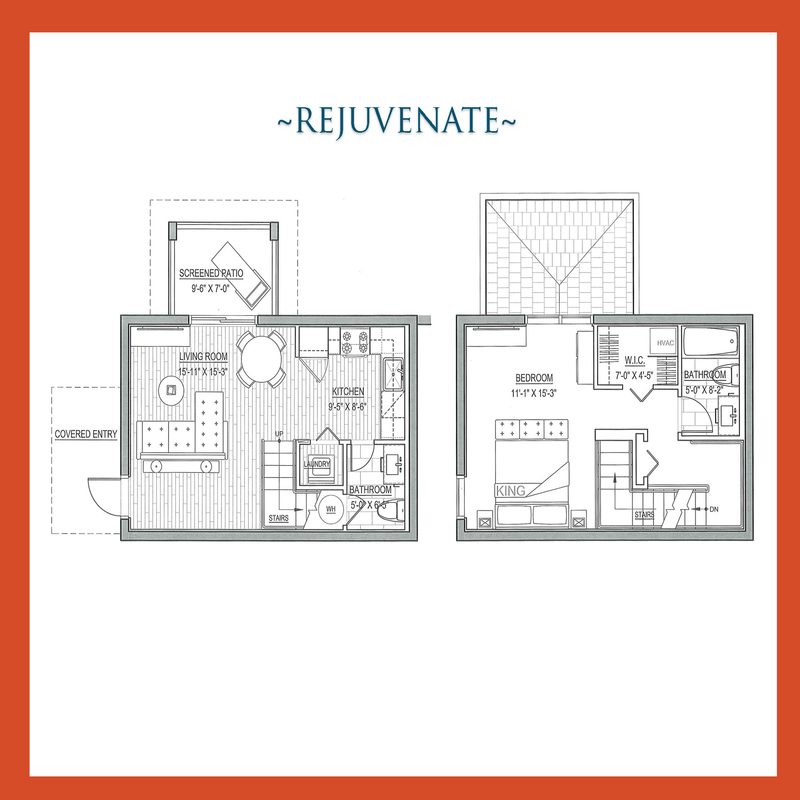 The upper level contains a large master suite with screened-in patio and a private bath with dressing area. The oversized second bedroom has a large closet and en suite bathroom. This apartment home starts renting at $1,535. This three-bedroom, 2.5-bath townhome has 1,495 square feet of living space. The lower level has a U-shaped kitchen with built in dining island and pantry closet, a screened-in patio, a living room with fireplace* and closet, and a half guest bath with laundry closet equipped with a full size washer & dryer. The upper level contains a master suite with private bath and two closets, two additional bedrooms, and a second full bathroom. This apartment home starts at $1650. * Pricing and availability are subject to change. Please call the leasing office for more details.